The master detective Hercule Poirot had a knack for sizing people up to flush out a murderer from a tight network of suspects. During his investigation, he’d propose a number of narratives based on the evidence he turned up. By detailing each suspect’s motive and means, and closely observing their actions, he would unmask the murderous spouse, lover, or solicitor, or all three acting in league. Many of the skills Poirot employed as a detective, including observation, evaluation, and experimentation, are applicable in the classroom. Provide students with opportunities to practice and master detective skills needed to make them life-long learners. Let’s start with the tool Poirot used most: close observation. Poirot had an eye for small details that would escape the average observer. Essential Lens: Analyzing Photographs across the Curriculum provides students with training and practice in close observation skills using photos of international student protests, Depression-era portraits, brain stem nerve cells, and Martian craters, among other subjects. Students learn to extract information from photos, giving depth and context to a lesson or an argument. Each student will notice different details, which sparks classroom dialog, especially for students who have difficulty with text documents. For example, students can examine photos of immigrant housing taken by Jacob Riis in 1890s New York City with current photos of refugees and displaced peoples. A number of similar details can reveal a pattern, providing clues to larger processes at work. Students can learn strategies of pattern recognition with Mystery Operations and People Patterns from Teachers’ Lab: Patterns in Mathematics. Students can work in pairs or groups to sort through features and conditions that may constitute a pattern, as they narrow down the correct pattern that applies to all the data. Our detective now has some details and a possible pattern in order to develop a theory. How can he know he is on the right track? By experimenting! Experimentation is a precise business. In order to establish a cause and effect relationship, as opposed to a strong correlation, the experimenter has to rule out alternative explanations. In many situations, the evidence may not be decisive, so the investigator has to weigh the validity of each piece of evidence and make the case for the conclusion. During a lesson on the Industrial Revolution, a 7th grade history/social studies class reviews primary and secondary source material. Together, students develop their skills of annotation, sourcing, corroboration, and class discussion to evaluate the source materials at hand. Watch the students’ analysis, guided by their teacher in “Blended Learning: Evaluating Source Material” from Reading and Writing in the Disciplines. Students can practice these skills with two interactives – Balancing Sources and Evaluating Evidence — from America’s History in the Making. Even Poirot knows that the evidence does not speak for itself. It takes a well-reasoned argument based on facts relevant to the question to make a convincing case. In Reading & Writing in the Disciplines, “Facilitating a Socratic Seminar,” Teacher Kristen Ferrales demonstrates how having her 11th grade students write to prepare for a discussion about the lasting impacts of the Haitian Revolution creates a deeper understanding of the topic and leads to a more productive Socratic seminar. In today’s multi-channel media and learning environments, students need to be aware of the many sources of information. They need to build the skills for evaluating the validity of those sources and develop their own understanding. With training and practice, your students can develop their grey cells to become as masterful as the little Belgian detective. Photos are immediate—they are unstaged, unplanned, caught in the moment to stand as witnesses to history. …well, some of the time. Some photos really are all that, and they really do capture a moment that speaks to millions of people. Filo did not stage this photo. 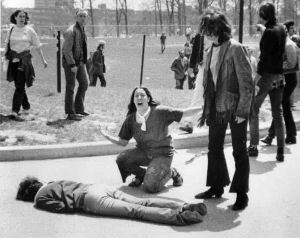 It went out to the American public via LIFE and other magazines and communicated the shock of the incident, in which National Guard soldiers shot and killed unarmed students protesting the Vietnam War. But between Filo taking the photo and LIFE publishing it, one little edit was made: the pole behind Ms. Vecchio, that looks like it was coming out of her head, was airbrushed out. Someone in Editing somewhere thought that pole coming out of the young woman’s head was too distracting and took it out. That someone wasn’t the photographer, in this case, but would it have mattered if it was? Does perfecting a photo after the fact take away from its integrity? If a photo is staged, can it be as powerful as a lucky shot taken on the fly? Is crafting a moment less authentic than capturing one? What do you see as you “approach” the family? What was missing from the first four photos that Lange felt she finally got in the fifth? The first photos are taken at a distance. The first shows all of the children, while the next three show just two of them. What do you notice about the final photo? (It is a close-up.) Do you think Lange made this choice to get closer deliberately? If so, what was she trying to capture? Why do you think the two older children are in the final photo? Do you think Lange asked them to step in? The mother has the same worried expression in all five photos; what does she do in the fifth that makes it even more powerful? Do you think she did this consciously, to give a better photo? Why do you think the children hide their faces? Discussing student responses helps them understand that crafting a moment for a photo can be just as powerful as capturing one by surprise, and that sometimes photos are a mix of lucky accident (such as Lange finding this family), and careful artistry (taking multiple shots and possibly asking people to pose a little). Also, they can consider how editing photos, even to remove objects that someone judges as distracting (like with Filo’s photo), can undermine authenticity. Try this exercise with other photos in the Essential Lens: Analyzing Photographs Across the Curriculum collection. Students can choose a photo that speaks to them and research the photographer to find other photos on the same topics. They may assess the artistry that went into that photographer’s work, and what makes one or two of their photos famous while others on the same topic are not.